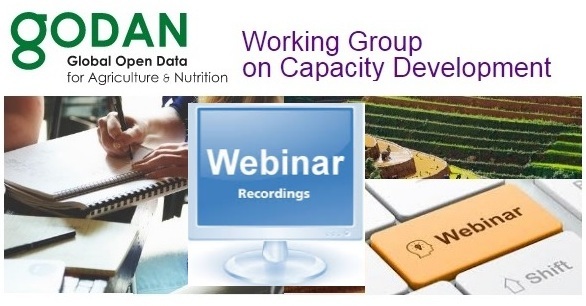 The first GODAN webinar (15 March, 2017) gave an overview of the activities of the GODAN Working Group (WG) on Capacity Development and explained how you can get involved. Webinar recording is now available online. Take the most out of the past GODAN webinar as its recording is now available online HERE. The Global Open Data for Agriculture and Nutrition (GODAN) supports the proactive sharing of open data to make information about agriculture and nutrition available, accessible and usable to deal with the urgent challenge of ensuring world food security. At the GODAN Summit in September 2016, GODAN launched a new Working Group on CAPACITY DEVELOPMENT. your inputs and suggestions to the Action Plan on Capacity Development. For more information contact: suchith.anand@godan.info (Suchith Anand) or lopes@cta.int (Lopes Ramos, Isaura).